“Tell me they got it in slow motion!” – screams the character of Deadpool after a long intense action scene. And that makes perfect sense because when shooting important events happening at high speed, you might want to slow down the video afterward to show every little detail of a scene. Besides, thanks to the media, we now know that tons of casual everyday things – like water drops or human reactions – will look fantastic if you capture them on a slow-motion video. Hence such high interest for the effect. So if you’re a looking for a free video editor with the slow motion effect on board, this tutorial is for you. We’ll show how to apply it in the software named VSDC. It works on Windows and it’s absolutely free. Import the footage to VSDC video editor. If you only want to have a part of the video in slow motion, you’ll need to split the file* and separate this fragment from the main piece. If you want to have the entire video in slow-mo, jump to step #4. The fastest way to split a video file is using the “razor” located in the quick access “Cutting and splitting” menu at the top. Simply place the timeline cursor at the desired moment and click the Split icon. Repeat to get multiple video fragments if needed. Select the fragment where you need the video to slow down. Go to the Properties window on the right. If you don’t see it, click on the video fragment with the right mouse button and select Properties. Scroll down the menu to the Speed (%) section as illustrated below. Decrease video speed gradually and use the red Preview button to see the result of your actions. 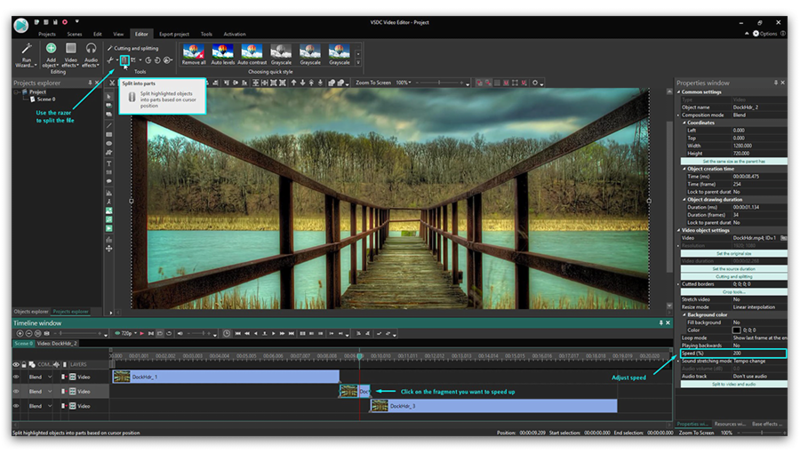 The way you apply a slow-motion effect in a video editor is pretty straightforward. Reducing the speed by 50% means that your video will slow down by a factor of 2. If you set up a 25% speed – it will be 4 times slower than the original, and so on. First, it’s a good idea to make slow-motion fragments a part of your story, but resist creating the entire video in slow-mo. No matter how much you like this effect, too much of it may not be effective to keep the attention of your viewers. Second, keep in mind that when you slow a video down it affects the audio too. And sometimes it may sound funny and appropriate, but most times it’s absolute nonsense. That’s why you may want to consider muting the original audio track and creating an audio overlay. They say classical music works great with slow-mo videos! *Having troubles splitting your video file? See our detailed instruction on how to split videos.